Who ever came up with the phrase “best thing since sliced bread” clearly wasn’t talking about the taste! Because let’s be honest – homemade (or even bakery) bread tastes soooooo much better than basically any sliced “bread” we buy at the grocery store. That stuff is mostly air with some overly-processed carbs and other random junk trying to trick you into thinking it’s bread. Doesn’t it just look so thick and delicious? Nice crisp crust with just a little sticky honey, and soft and chewy inside. We ate the whole loaf within two days. And we would have eaten it faster except my husband was hardly home during those two days! I don’t make homemade bread very often. In fact, this was my first attempt in a few years. But it turned out so well, and was actually pretty easy to make, that I think we’ll be making lots more! 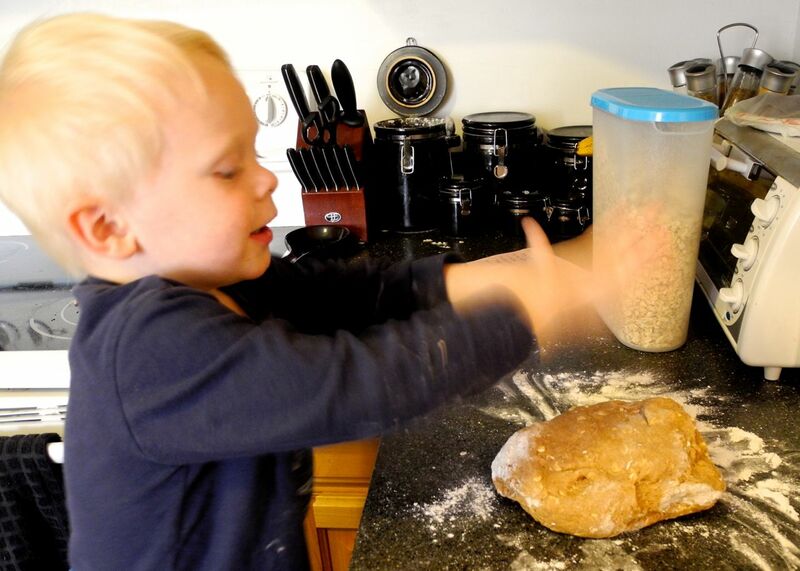 Plus, my two-year-old had a blast helping me knead the dough! See, kids can help in the kitchen! 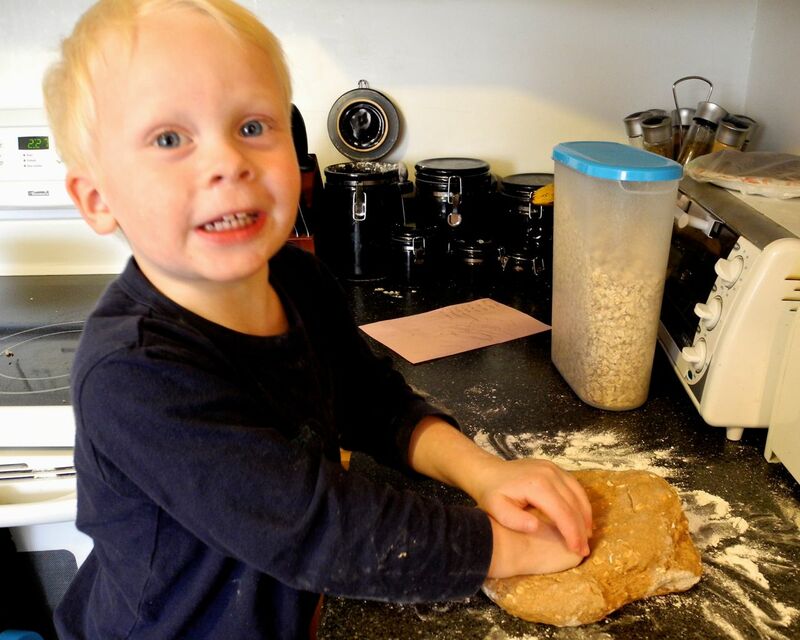 Granted, he did get flour all over himself… but he was actually pretty helpful with the kneading. I can’t actually take credit for this recipe – I used this wonderful recipe from Bakingdom. However, I did make a few changes. I used whole wheat flour instead of all-purpose flour. And it turned out great! 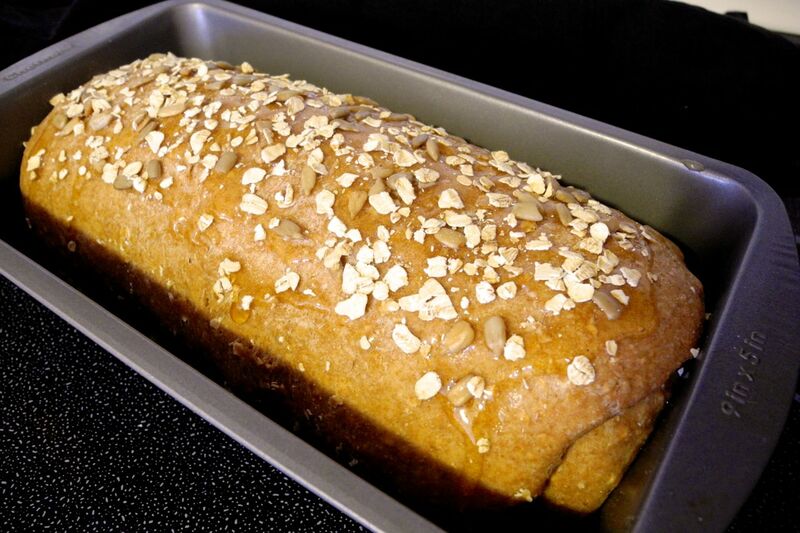 I also sprinkled sunflower seeds on top of the bread along with the oats suggested in the original recipe. 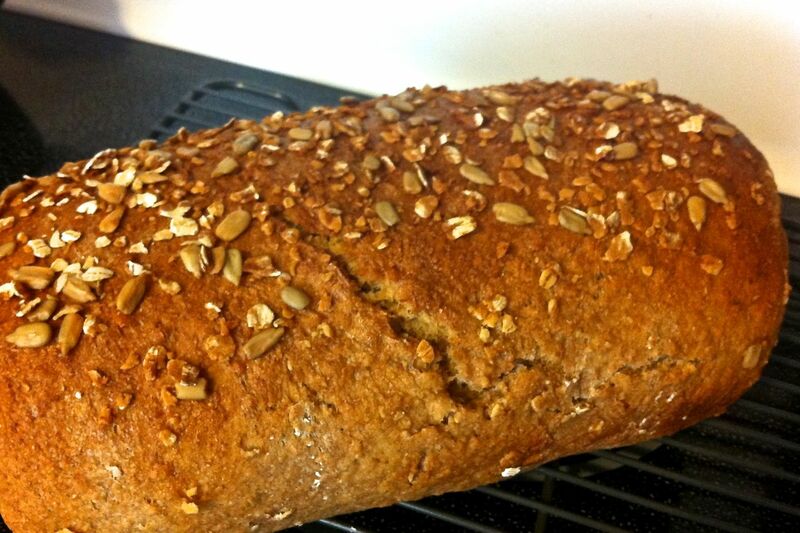 The seeds added a nice nutty flavor that complemented the whole wheat and honey flavors beautifully. 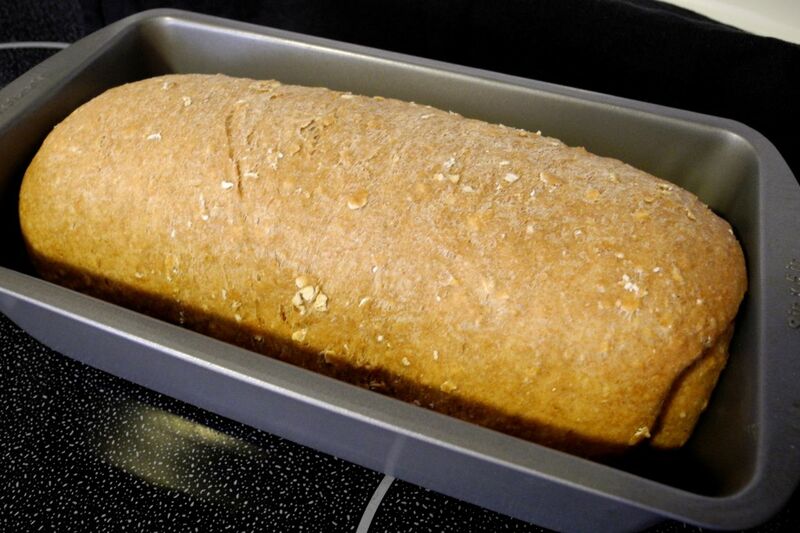 Using whole wheat flour instead of all-purpose flour means lots more fiber and vitamins in your bread! Add that to the oats (bring on the fiber) and sunflower seeds (healthy fats and proteins) and honey (tons of vitamins, minerals, etc.) and you have a bread that’s delicious and nourishing! It hasn’t even baked yet, and it already looks scrumptious! If you’re intimidated by making bread (I was!) or envision spending hours in the kitchen kneading, try out this recipe. It’s really easy and doesn’t take much time at all (other than waiting for it to rise). 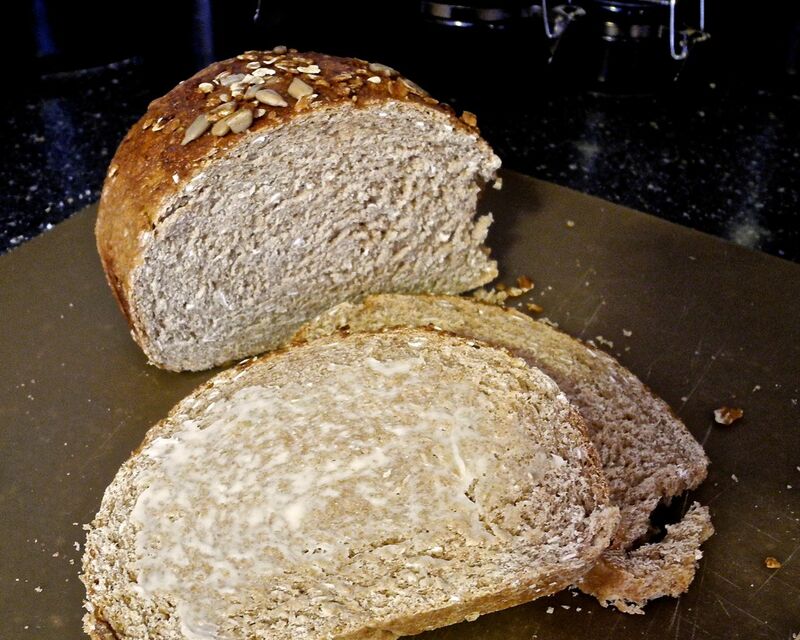 I was pleasantly surprised by how quick, simple, and delicious this bread was! The wonderfully golden bread after baking. I could hardly wait to slice into it! I’m testing out a few more bread recipes over the next week, so I’ll be sure to let you know how those turn out! Hopefully with a little more practice, I’ll be adapting and coming up with my own recipes soon!